Norma Mae (Collier) Abreu in Woburn, December 5th. Beloved wife of John F. “Johnny” Abreu, at ninety one years of age. Cherished mother of Robert and his wife Sharon of Brewster, James of Woburn, and Paul and his wife Denise of Billerica. Loving grandmother of Robert Abreu Jr, Edward “Teddy” Barrett III, and Derek and Jason Abreu. Dear sister of Murray Collier of Maine and Arthur Collier of Billerica and the late Allen Collier of Wakefield. Relatives and friends are invited to pay their respects on Tuesday, December 11th, from 10-noon, with a prayer service to follow at noon at the Lynch-Cantillon Funeral Home, 263 Main St, Woburn. Burial will take place at the convenience of the family. Remembrances may be made in Norma’s name to the Sawtelle Family Hospice House, Gift Processing Center, 41 Mall Rd, Burlington, MA 01805. For directions or to leave an online condolence, please visit www.lynch-cantillon.com or Facebook under Lynch-Cantillon Funeral Home. 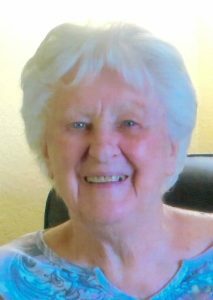 Norma Mae (Collier) Abreu passed away peacefully on December 5th at the Sawtelle Family Hospice House in Reading at ninety-one years of age. Born in Boston, Norma was the daughter of the late Merle and Aola (Guest) Collier of Woburn. Norma was raised in Medford and Stoneham and graduated from Stoneham High School in 1945. An athlete early in life, she played basketball and field hockey for the high school teams, and liked to ice skate, roller skate, play softball and bowling. She worked at Sylvania after high school. In 1952, Norma married Johnny and they resided in the South-end of Woburn in the Abreu Homestead where they raised their family. She lived there right up until moving to the Sawtelle House for her final weeks. They were avid campers spending many summers at campgrounds in central Mass, loved to dance, and spend time with family and friends. Norma also enjoyed Country music, square dancing, and traveling. As a Grammy, Norma enjoyed spending countless hours watching her grandsons grow up. A kind, loving, and generous woman, she was known for her great sense of humor, always had a funny story to tell, and was the life of the party. She kept her nurses amused right up until the end! Norma’s vibrant personality and love for her family shown through and she will be deeply missed by them all. Along with her husband Johnny, Norma is survived by her children, Robert and his wife Sharon of Brewster, James of Woburn, and Paul and his wife Denise of Billerica. Loving grandmother of Robert Abreu Jr, Edward “Teddy” Barrett III, and Derek and Jason Abreu. Dear sister of Murray Collier of Maine and Arthur Collier of Billerica and the late Allen Collier of Wakefield. Relatives and friends are invited to pay their respects on Tuesday, December 11th, from 10-noon, with a prayer service to follow at noon at the Lynch-Cantillon Funeral Home, 263 Main St, Woburn. Burial will take place at the convenience of the family. Remembrances may be made in Norma’s name to the Sawtelle Family Hospice House, Gift Processing Center, 41 Mall Rd, Burlington, MA 01805. For directions or to leave an online condolence, please visit www.lynch-cantillon.com or Facebook under Lynch-Cantillon Funeral Home. Evelyn and I (Raymond Short) wish to extend to you our sincere sympathy on Norma’s recent death. Norma and I were first cousins as her father and my mother (Mae Collier Short) were brother and sister. Your Uncle Arthur contacted us about your mother. Norma is already missed. Mt. Misery is not the same without here. She was “awesome”! Always cheery with a positive word. Loved her laugh. Heaven just became a little more fun, now that Norma has arrived! Hoping her family, Brenda and her many friends find solace with many treasured memories. Auntie Norma. My favorite aunt. I’ll never forget the time I lived with you. The fruit trees out back. The unconditional love you gave me.. (I know I was a pain). 😘😘😘. Safe travels. Love you.